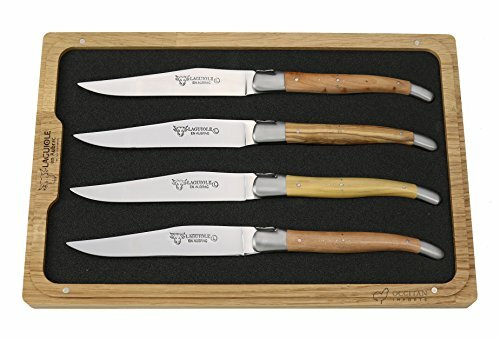 Set of 4 heirloom-quality, handcrafted French steak knives with mixed french wood handles, shiny stainless steel blades, and matte finish stainless steel bolsters. Blades are made of Sandvik high performance knife steel, which allows for razor sharpness, high hardness, exceptional toughness and excellent corrosion resistance. Presented in an elegant, high quality, black wooden box. Made in France by Laguiole en Aubrac.